For years, I’ve had these bouts of broken thinking where I imagine that we’re going to quickly knock out some maintenance task and immediately go sailing—to the point where I drive around with the MVS (Minimum Viable Sailing) gear in my truck for days on end. To be clear, this has never worked, but I loaded in the sails, running rigging, and required safety junk anyway. Our mast was supposed to be stepped on Tuesday. Tuesday, Wednesday, Thursday, and Friday all elapsed as expected. My plan for Saturday was to do some engine maintenance and go sailing, but on Saturday morning I received notice that it was likely too windy to put our mast up…meaning that it was still notably down. Even with that knowledge, we drove to the boat. I wasn’t in any hurry to work on the engine stuff, since I figured it would only take about an hour, so we wandered around the marina for a while, watching other boats (with masts) get launched. After spending all last weekend washing the boat, we also had to suffer the indignity of having an absolutely immaculate Bristol Channel Cutter docked next to us. With wood like polished agate and rigging surpassing salty and heading straight into pure whimsy, it made our mastless boat look like a half-used bar of soap. But on to maintenance: it had been recommended that we warm up the engine before changing the oil, and it dutifully fired right up. We were momentarily confused because Tom started the engine on the travel lift at exactly the same time and we thought that our engine sounded like a backhoe under duress, but we put it together and let the ol’ Beta 14 happily chug for a bit. We even put it in gear to check that the stuffing box was weeping a little lubricating water but not shooting out water at geyser proportions. Having never actually done any small diesel maintenance, my estimate of “about an hour” was a lot like Rain Man’s estimate that a candy bar costs “about a hundred dollars.” It’s not that the work is particularly finicky or difficult—it’s that you can’t get to anything. I’ve built a ship in a bottle, because, well, that’s how I roll, but I didn’t have to do it while locked in a knocked-over telephone booth, reaching through a tiny port into a cavern from which no light can escape. Fortunately, Jen was there. She has not built a ship in a bottle, and therefore had much more reasonable expectations. Jen is a champion. The process of changing the old oil seemed straightforward. Our engine has a built-in hand pump for extracting the used oil, but that didn’t seem to do anything at first. The manual made reference to a “tab” (which I think is actually a ball valve) that I still haven’t seen but eventually felt. With that turned, I was able to operate the pump through the side hatch while Jen held a bottle through the main engine door to catch the oil coming out of the tap. I simply skippered the process of changing the oil filter while Jen did all the work, and then I filled the oil while Jen checked the level periodically. I really wanted to do the impeller, since I’ve never seen the inside of a water pump, so I mostly did that one and fumbled my way through an explanation of how a bent fin changes the relative pressure in the chamber. One of the fuel filters was easy, since it’s not in the engine bay, but I don’t even want to talk about the fuel filter on the engine…I could see it and Jen could reach it, and after many rounds of “touch something and I’ll tell you which way to move your hand” we eventually gave up on that for the day. I then theoretically bled the fuel system, and while I have little confidence that I did it correctly, the engine did run after all of this and nothing came gushing out of anything. This should be much easier when we do it again in the fall. That’s apparently the ideal time for it, but the previous owner was on a spring schedule (and was kind enough to show me how it was done when we bought the boat, despite my complete inability to recall any of it). At the end of last season, I decided to let it go one more annual cycle since the basic winterization process was already a near-complete mystery to me. We were told that the wind would be better on Sunday, and that our mast would finally go up. The marina actually put a sling on our mast, hoisted it on the crane, and got it all the way to the mast step—close enough to connect the wires to the mast lighting. I am grateful that they checked. This is the perfect time to fix it. But I’m going to start having conversations with house plants if I don’t get to sail soon. At some point we were reminded, however, that we never actually set up the new boom. 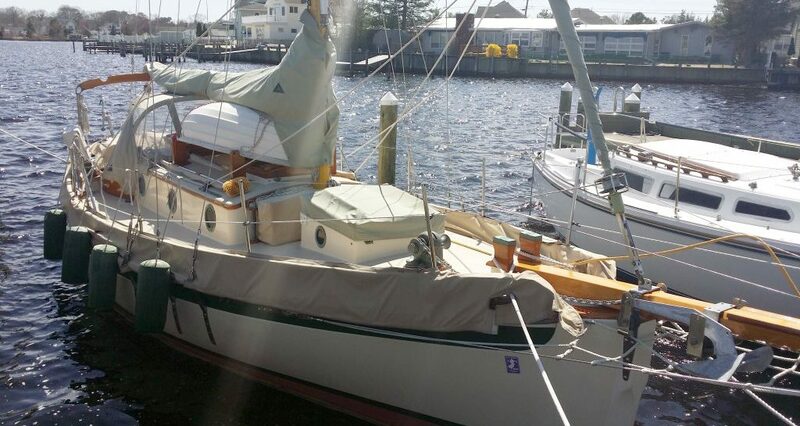 Having driven all the way to New Hampshire to get it, I had kind of chalked it up as a fait accompli, but there was a lot of hardware on the old boom that I wanted to move over to replicate our reefing and outhaul setups. I started in the typical way, by shearing off the screw heads. This, surprisingly, did not make it any easier to remove the hardware. Then I sheared the screwdriver. I guess those screws are really in there. We just put the booms down and left the marina. After some decompression time, we returned and proceeded to meticulously de-engineer the boom with a pair of Vice Grips, a novelty hack saw, and a large assortment of other inappropriate tools. The inside of the boom looked like a Piney Planetarium by the time we were done with it. If you rub your eyes really hard and then quickly take a peak in there, it’s pretty much like Laser Floyd at the Fels. It’s still not done, but it’s close. We could use it as-is, as long as we don’t need the second reef, and I don’t really want to shakedown my first attempt at scratch-tuning this rig in double reef weather. Once again: maybe next week. As for this past weekend, it was great to work on the engine together. It would have been far more annoying to do it alone, and I think Jen may have surprised herself with how well she did on her first oil and filter change. She seemed genuinely interested in learning about it with me. As much as I whine about not sailing, there’s more to it than just getting blown around by the wind. Being able to work together to solve problems on systems that you understand is probably more important in the long run than crisp tacks and impeccable sail trim. That last paragraph. Exactly. Sailing is awesome but working on the boat together, discovering which jobs come natural to each of us so that one can help the other learn, and getting into a comfortable work rhythm on the boat is wonderful. It makes the end of work beer taste just a little better. It always makes me a little sad when I hear couples yelling at each other as they go about their boat chores. Sailing is as much about the two of us as it is about anything else. Very true Donna. As any of our regular readers know, we’ve had our yelling moments, but I believe having to figure things out in emergencies and tense situations has ultimately led to much better communication. Discovering solutions together is much more rewarding than being the angriest couple in the anchorage.